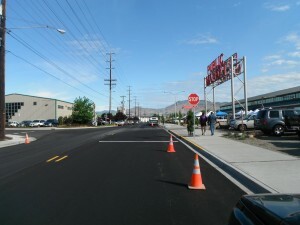 In association with the opening of the Pybus Public Market, the City of Wenatchee carried out a street improvement project along Worthen Street and Orondo Avenue to improve access to the market and provide a safe and pleasant environment for pedestrians and bikers. Construction narrowed Orondo Avenue to two travel lanes in order to minimize the pedestrian crossing distance; upgraded the four-track rail crossing to improve safety; and added bike lanes, curbs, gutters, and twelve-foot sidewalks on both streets to accommodate non-motorized travel. Overall, the redevelopment of the Pybus Market, Worthen Street and Orondo Avenue has increased walkability and community interaction in the neighborhood. A full overview of the Pybus Market and Associated Street Improvements project is available here (pdf).